Retaining walls can often be the facelift that your landscape needs to be the yard if your dreams. There are a many different functions and benefits to investing in a retaining wall. Not only do these features add beauty to your yard, but it also protects your soil and grass. In this blog, we will go over everything you need to know before making the decision to add a retaining wall. Retaining walls are found around homes that need a little support with their landscaping. If your home is on a hill, or the ground isn’t level, this is when it is needed. The main reason to invest in a retaining wall is to prevent soil erosion from rain. What is soil erosion? Soil erosion is the wearing away of topsoil due to natural forces such as water and wind. Reduces soil erosion by managing water runoff and slows down rainwater. Creates focal points in your landscape by creating areas for planters and flower beds to add color and life to your landscape. Creates more functionality by acting as seating for people to gather around and sit on, especially if it’s near a firepit or fireplace. When you are deciding if your landscape will need a retaining wall, look more into the different benefits to having one. 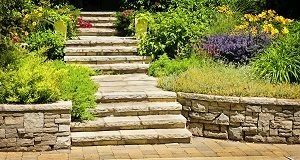 A walkway or patio: you can do this by having a walkway of pavers alongside of the retaining wall whether it is just a path or even stairs which can lead to a patio. Add a firepit or fireplace: retaining walls will go great with an addition of a fireplace or a firepit to incorporate extra seating. Add a water feature: you can choose from a pond or a waterfall and have it surrounded by a retaining wall. Retaining walls are a great feature to add to your landscape to make your backyard or front yard come alive. If you are looking to add a retaining wall to your landscape, then contact the professionals at Greener Horizon. Our promise to you is that we will get your landscape looking its best while also maintaining a positive customer experience.